Golden colorado’s Denver Sports Lab is on a mission to bring high-end ski tech to the masses. Denver Sports Lab is not your typical ski shop. First, the warehouse space, which is located at 15744 W. 6th Ave Frontage Road in Golden, is notably lacking the racks of retail that fill most shops. Then there are the photos covering the walls of serious-looking techs behind the scenes at various FIS World Cup and Olympic ski events. And perhaps most out of the ordinary, the guy behind the counter is likely to invite you into the workshop and engage you in a serious conversation about your equipment. It’s clear that Denver Sports Lab co-owners Leif Sunde and Sam Petty aim to be different, and they’ve built their growing business on the premise that truly professional ski and board tuning can be for anybody. “We offer World Cup and Olympic level service to everyone, whether you’re a competitive athlete or a weekend skier. Everyone deserves that level of reliability, quality and consistent attention to detail,” Sunde says. 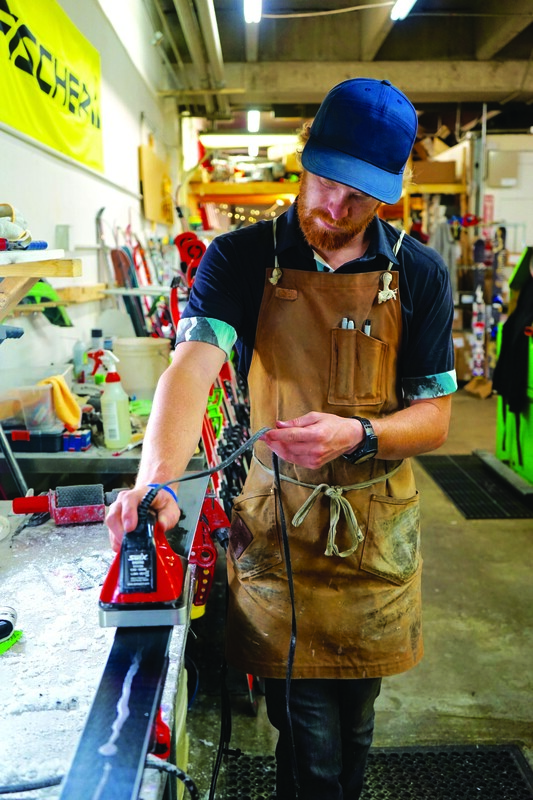 The concept was born in 2012 when Sunde and a friend who was a fellow World Cup ski and boot technician, lamented the lack of reliable ski tuning in Colorado. “My friend said that when he was home off the tour, there was no place he trusted to bring his skis. I felt the same way, so I suggested we start our own shop,” Sunde says. The idea was to open a tune shop that provided World Cup quality work and customized service for any skier or snowboarder who wants her equipment in tip-top shape. Tune jobs can be wildly inconsistent, something the shop remedies with a streamlined, regimented process that starts with a thorough inspection followed by a clean-and-condition treatment. Denver Sports Lab uses only grinding stones, instead of the less-precise, inconsistent sanding belts used in many shops around the country. The skis or board are finished off with a hot hand wax using an environmentally friendly, plant-based wax. These technical details matter, says Sunde, because a proper tune can make the difference between having an “off day” on the slopes and feeling confident on your edges. “People misconstrue tuning as being only for racers, but really, it’s for anyone who wants an increased sense of control and predictability of response,” he says. Sunde and Petty are diligently spreading the tuning gospel to recreational skiers and riders. Besides inviting every customer behind the counter to see the process, Denver Sports Lab also offers hands-on experience through the shop’s tuning workshops. Their Ladies in the Lab workshops, the brainchild of Sunde’s girlfriend, are especially popular. During the workshops, attendees cover how to inspect equipment, hand sharpen edges and clean, prep and wax the base. Skier Scott Morton discovered the shop a few years ago when he was just getting into the sport. While he wasn’t an expert at the time, he appreciated attention to detail and quality work.